The largest groups love the 56-passenger bus because of its size, versatility, amenities, and the myriad of safety features it provides. We understand the importance of security and efficiency when you’re traveling with a large number of people, and that’s why we make sure to keep the 56-passenger bus in our network. If you’re looking for a safe, reliable transit solution for a large group, call us today to book. Seattle Charter Bus Company has experience servicing large groups for events of all kinds, including corporate meetups, sports competitions, school events, weddings, and more. To satisfy the needs of our clients, we have developed an extensive network of buses, drivers, and resources that are readily available upon booking. Call one of our 24/7 reservation specialists today at 206-257-3880 to learn more about how we can assist you. Is your group too small for a full-sized coach but too large for other vehicles? The 25-passenger minibus will give your group plenty of space for your sports trip, corporate event, or even a class field trip without an excessive number of seats being left open. With a little more room for slightly bigger groups, the 20-passenger minibus offers all the same compact benefits as its predecessor along with a few extra seats. No matter the type of event, a 20-passenger minibus offers a comfortable ride for every member of your group. 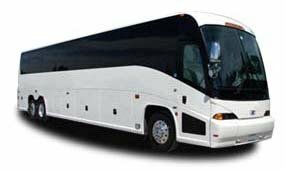 The 56-passenger charter bus is most popular among large groups attending events like large-scale industry conferences and relatively big wedding services. Along with plenty of seats and storage space, the full-sized coaches we charter also include more available amenities than minibuses. Zip through busy Seattle roads in this small yet comfortable model of minibus. The 18-passenger minibus is one of the most popular options for relatively small groups traveling for a private event like a bachelor party or group social gathering.